Getting married in Bali is not as easy as it looks. You cannot simply arrive there and expect everything to go like clock work. This is Bali and as a third world island that’s part of Indonesia there will be problems unlike those you would have back in Australia or in your home country. That’s not to say that these are insurmountable or should in any way put you off getting married in this fabulous place. But there will be hassles. To make things easier the team at Your Bali Wedding though we would put together our A to Z guide for getting married in Bali. 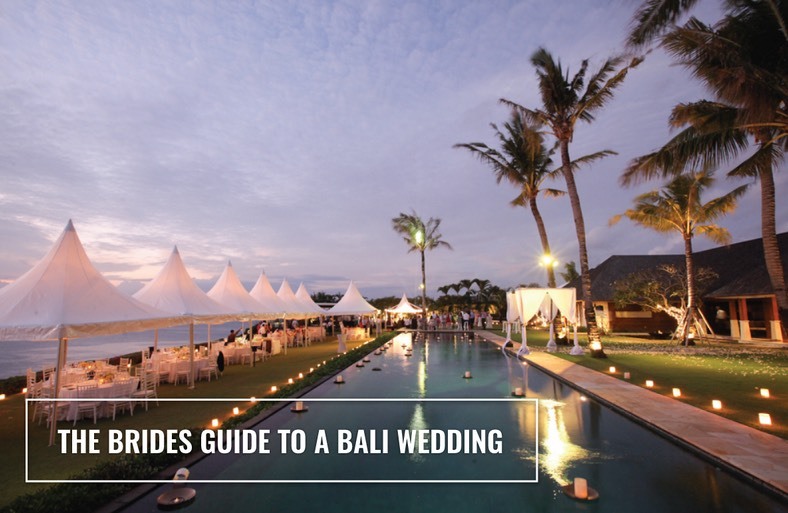 These are gold and you should definitely read this before you decide on a wedding in Bali. A: Ask other people about their previous experience about their Bali wedding. See what they had to say about it and if they enjoyed the experience. If you don’t know anyone who has gone to Bali to get married perhaps Google some Trip Advisor reviews to see what other couples are saying. B: Be aware that there are different laws in Indonesia when it comes to the legality of your marriage. If you’re an Australian make sure you speak to the consulate before you do anything. Indonesian laws and customs are far different to those back in Australia so you have to conduct your due diligence before making any concrete decisions. We want to add another tip for B and that is the budget. Bali weddings are cheaper than back in Australia but have a realistic budget. Don’t expect to have 50 guests at your wedding for $5000. This is crazy unless you want to do it yourself. And then your going to run into problems. Expect to pay $15 000 upwards for your Bali wedding depending on the number of guests and wedding venue. C: Chapel Weddings are very common in Bali especially those of the Catholic or Christian faith. There are a few beautiful churches in Kuta, Nusa Dua & Berawa / Canggu where you can get married. – there are churches so don’t stress about that. We can find some great ones near your hotel or villa. – there are also priests in Bali who can perform the ceremony but if you prefer a celebrant this can also be arranged. One point to note here is that this may affect the legal implications of your wedding. You will in most cases have to do the legal stuff back home and then use the celebrant in Bali as a token gesture. We have a few celebrants you can use. But ask Cindy (our head wedding planner) which one she prefers. For more information about the legal implication of getting married in Bali, click here. D: Wedding dresses can be bought from your home country or arranged in Bali. Most airlines will be respectful of your wedding dress and allow you to bring it on board the plane and hang it up. Alternatively if you want to buy your Bali wedding dress it’s advisable to organise this well in advance with your wedding planner who will put you in touch with wedding courtiers. E: Earlier the better. Try to get to Bali at least 2 to 3 days before the event so you can relax and enjoy the island. Try to get into holiday mode. The last thing you want to do is arrive the day before and be all stressed out. You will need time to acclimatise to the climate, the culture and the chaos that is the wonderful Bali. F: Flowers can be organised by your wedding planner. Don’t attempt to bring them from back home they will not last in the heat. G: Guests arriving to Bali for the wedding should be staying close to each other as traffic jams can extenuate travel times. If the wedding is in Seminyak then guests should be in a Seminyak hotel or in a couple of villas near each other. People spread out all over the island is a recipe for disaster. Having friends and family in one convenient location makes the whole wedding experience more intimate. Friends & family get to share the same wonderful experience if they are all near the bride & groom. We want to add another point for G and this is: Gay weddings in Bali are forbidden. Sad but true this is the way it is in Bali due to the fact it’s part of a Muslim country. You can’t even have symbolic ceremonies. Forget about it! We want to add a third point for G: Garuda is the national airline of Bali and flies out from Sydney, Melbourne, Perth, Adelaide, Brisbane or Darwin to Bali. They are far more lenient with baggage restrictions so brides take note if your intending to travel with masses of clothes and dresses. H: Hotels can offer great wedding locations especially in areas like Nusa Dua, Canggu or Uluwatu. We do however recommend that you DO NOT go through a hotel for the wedding as their approach to weddings is far too ‘cookie cutter’ and impersonal. They often want you to use all their facilities, accommodation, food and beverage, celebrants, entertainment which might not suit you. Again, it’s best to use the hotel ONLY for their location and the ceremony and take the party and accommodation elsewhere. You might be thinking that of course we are going to say this because we are wedding planners but the truth is that hotels perform so many wedding that they offer zero difference or customisation. If your happy to have a ‘same as’ style wedding then a hotel may be a good option. But, remember any variation will cost you a lot of money to change. Hotels are very strict in this regard. I: Islamic weddings in Bali are easy to perform. Indonesia is an Islamic country, therefore the wedding process is simple. Muslims do not even have to have their ceremony in a Mosque. You will however have to have some documentation proving that you are Muslim. The ceremony will be performed by a Balinese official from the ‘Kantor Urusan Agama’ – The Office of Religious Affairs. We want to add another point for I: Invitations should never be sent out until the venue date is locked in. You may like a venue such as Villa Bali Agung, Villa Shalimar or the lovely Villa Eden but these do get booked out in advance so have dates secure before printing the invites. You may have to be flexible on dates. Also don’t book flights until the dates are locked in. J: If your Jewish and want to get married in Bali you can have the ceremony with elements of your Jewish roots and past but the legal paperwork will have to be done back home. A Jewish wedding in Bali will only be symbolic but still loads of fun. A celebrant will perform the ceremony. Jewish couples may be deterred because it’s a Muslim country but don’t stress, it’s totally fine. Remember it’s only a ceremony and it will be very private. We want to add another point for J: Jetstar is one of the carriers that will take you to Bali. K: Kids at the wedding can be an issue if they get bored, hungry and tired. Screaming kids can ruin the event. However there is good news. If you having your wedding party at a villa most of the villas will have a games room or large TV to keep the kids entertained while the adults party. You can also arrange for nannies and babysitters to take care of the kids. L: Liquor for the wedding will be organised by your wedding planner at the party. In some cases you will be able to bring your own beer, wine and spirits but there may be a cost for this depending on the venue. M: Marriage in Bali should be organised about 6 months to a year in advance. Never leave it till the last moment. It takes time to arrange everything and wedding villas or venues can and do get booked out very quickly. Leave a wide margin for your wedding day if you can. This may be a problem if you have to get time off work at specific times so we do recommend planning this special day well ahead. If you Bali brides are reading this now ( Jan 19) then ideally your wedding should be mid to late 2019 or 2020. We want to add another point for M: You can change money as soon as you arrive in Bali. There is a great money changer at the airport once you clear immigration. You will need some Rupiah for the first couple of days in case you want to buy something, have a meal or go somewhere. N: Natural beauty of Bali. The island is the perfect for the wedding ceremony, party and accommodation. Just imagine having your wedding in a wonderful villa by the beach and then partying the night away in this sensational beachside location. Or what about a cliff top wedding followed by a fabulous party in a luxurious villa? Bali offers a smorgasbord of natural delights that is unique to this one island in this part of the world. I guess we are lucky living in Australia as Bali is so close and so easy to get to for your wedding. O: Overseas destination weddings such as Bali are really popular and when it comes to Aussies getting married in Bali it’s a lot more popular than you think. We get at least 10 inquiries per day about our wedding services. So if you want to have one of the best days of your life then do it in Bali! P: Professional wedding planner. You will need one. Don’t even think about doing this on your own. And remember there are dozens of ‘so called’ wedding planners who claim to offer a legitimate service so be careful who you decide to go with. Ask for references, testimonials and make sure their website looks legitimate. Also and I really want to highlight this point here; make sure your wedding planner speaks English. I have made reference throughout this website about attempting to go it alone and organise the wedding yourself but this is a nightmare. You will have issues! We want to add another point for P: There are lots of pharmacies in Bali so you don’t have to bring everything with you from Australia. You can get it all in Bali and the products are all the same as back home. For post party hangovers they do have Berocca’s. Q: Ask as many questions as you can before you decide on your wedding planner. Don’t be shy. Ask about the venue, cost, and any wedding packages they might offer. Also check out their website to see if they have a frequently asked questions page. This may help answer some of your questions. R: Rip offs happen with Bali weddings. The last thing you want is to be ripped off on your wedding day. Ouch!!! This would leave such a bad taste I your mouth. Be assertive and insist that your wedding planner detail all the costs upfront. Hidden extras can run into the thousands of dollars and can seriously blow your budget meaning credit card blow outs and digging into savings. This is not pleasant so be vigilant about this. S: Seminyak is the tourist heart of Bali and your going to want to spend some time here shopping, going to restaurants and if you like some partying. It’s got so much going on here and so much activity that it’s worth a visit. Most of the holiday villas are in the Seminyak area, which means that you’ll most likely be staying central to all the action. Seminyak also has a top beach area great for your wedding guests to swim, surf and recover after the big night of partying. T: Taxis are in abundance in Bali and the best way to get from the venue to the reception or from where your staying to the wedding venue or villa. Make sure you use the metred Blue Bird taxis as others may try to set an unrealistic price especially if they can see your in a hurry or a newbie to Bali. U: Uluwatu is one of the most scenic areas in Bali and is located on the southern tip known as the Bukit. It has dramatic and very picturesque cliff top views and it just so happens that we have 2 stunning Uluwatu wedding villas that’s perfect for your big day. It’s Villa Bali Agung and Villa Karang Saujana. Both have gorgeous views and are available to rent for the wedding ceremony and as villa accommodation for you and your guests. Uluwatu has a much more chilled out ambiance and vibe than the most touristy areas of Bali like Seminyak & Canggu so if your wanting to have your wedding in villas that exude luxury and a fantastic vibe then make sure you inquire about these. – the villas ( the ones we recommend) all have large garden areas where guests can mingle and relax. – travel times are reduced and this is great considering some of those notorious Bali traffic jams. W: Wedding organisers in Bali are easy to find. All you have to do is Google this and you will see a whole heap of them. But, be careful with your choice. Making the wrong decision will cause budget blow outs, headaches and extra hassles that you didn’t expect. X: the X Factor – we can give your wedding the x factor with lighting, music, food etc. Y: Your Bali Wedding has been in the wedding planning industry since 2005. So if your worried about which wedding planner to use, then don’t stress – your in great and capable hands with us! Z: ZZZZ’s make sure you get enough sleep before your big day!! Hope these points have helped but if you need any other information just give us a shout.